How statement is this beautiful blouse? I live for pieces like this, because they are an instant way to pull an outfit together. 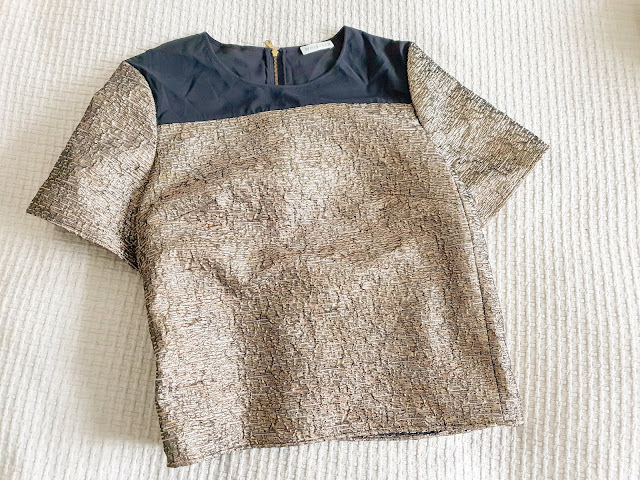 Throw this on with some slim cut jeans and a great pair of ankle boots and you have an instant outfit that looks intentional - and all because the top does the heavy lifting. Genius, eh? The dramatic silk tassels, delicate covered buttons and cut-outs running up the arm hold that balance between being covered up and revealing. Pieces with a lot of detailing like this also look more expensive than they really are. 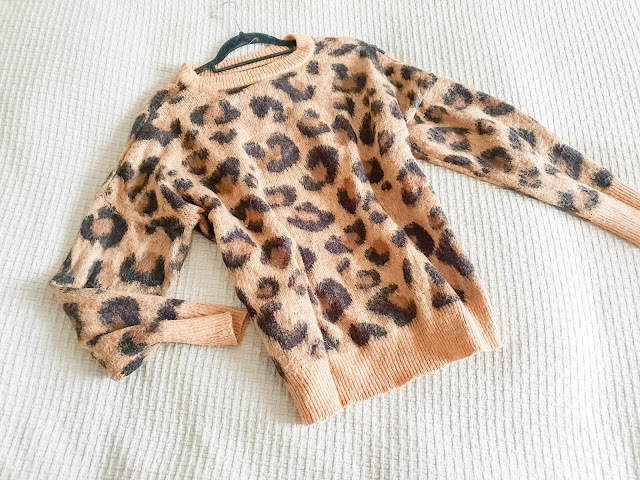 This was around the £40 mark but I reckon it could pass for something fresh off the catwalk. Leather and leopard are two common themes you're going to see throughout this haul! 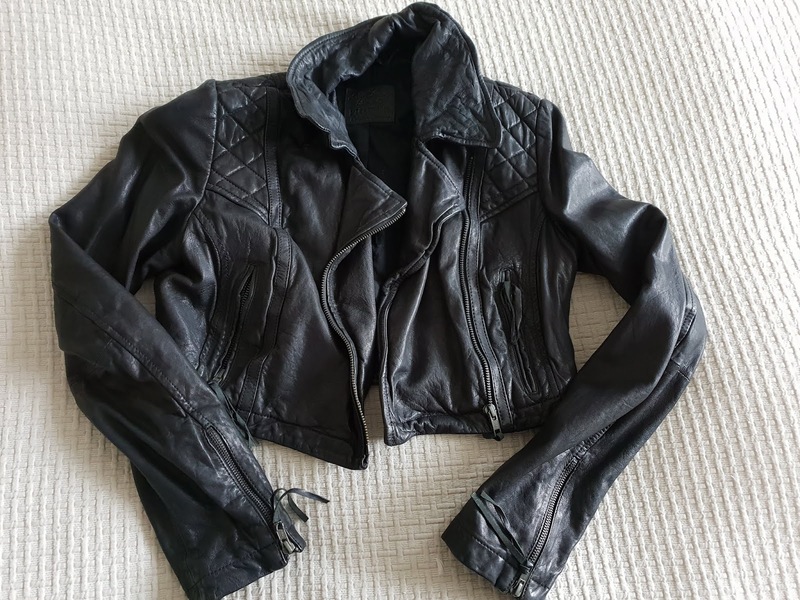 I just love the timeless, contemporary look leather pieces give, and the way the fabric can be easily dressed up with silks or down with Jersey basics. This dress is so sleek, and I love the toned down styling with the loose t-shirt silhouette and the cream, taupe and black colour combination. Worn with ankle boots or heels at night, or even trainers, this dress has the versatility to make it a wardrobe staple. 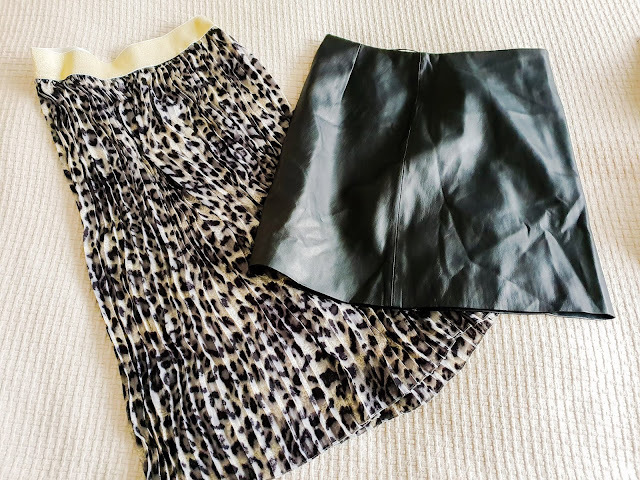 Leather skirts and trousers are very much a part of my style DNA, I like the way they bridge being sophisticated with also being a little bit dirty rock. Rock a leather pencil skirt and a roll neck and you have Meghan Markle vibes, but pair it with a band tee and biker boots and you have a great gig outfit. While my collection of leather skirts has grown, one constant is the simple black leather mini. Having had a Whistles one that I wore until it was literally falling apart, I knew this was a purchase I'd get a lot of mileage out of. The A-line cut is way more flattering than anything too bodycon, and I'm looking forward to pairing this with knits and shirts this winter. 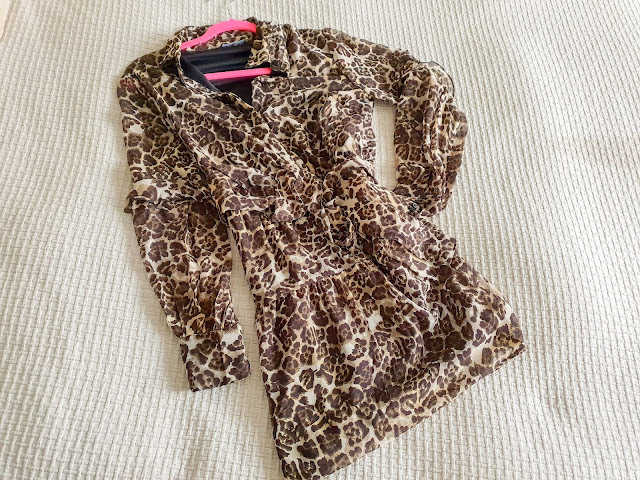 Leopard is the print that's everywhere this season, but it's never gone out of style for me! I'm loving being able to get leopard everything at the moment though. Despite the fact it's all over everything, I was struggling to find a pleated midi in the print, but I eventually tracked one down online. This would pair up with a roll neck jumper and the cropped leather jacket so well, or work with a lacy bodysuit for the evening too. A cosy faux fur is a winter classic - warm and snuggly while still bringing the glam, and this one is so beautiful. Biba brings that 60s and 70s heritage along with their own Art Deco design influences. There are definitely degrees of quality when it comes to faux fur and this one is stunning- thick and lush with those beautiful silvered tips and petrol blue chevrons. The finish is also high quality with that lovely patterned black silk lining and gold chain to hang it up with. 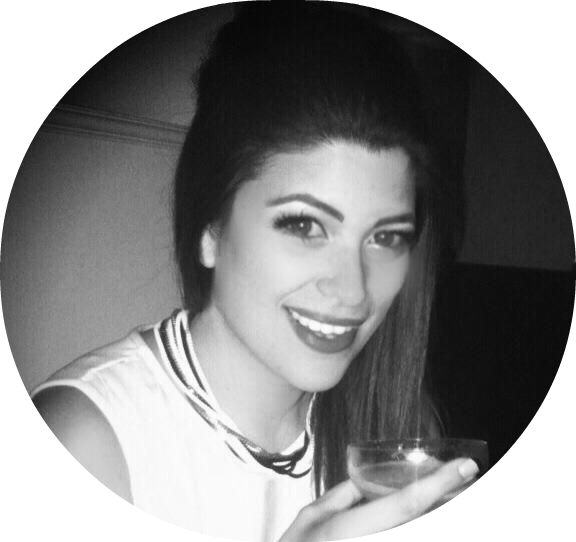 As gorgeous for a night out as it is with jeans and trainers. I feel very Marc Bolan in this, although my husband thinks the effect is more Cookie Monster! I'll take it though, CM is a style icon in my book. Marks and Sparks seem to be finding their style feet again recently, or perhaps it's a sign of getting older that their clothes are starting to look more appealing? 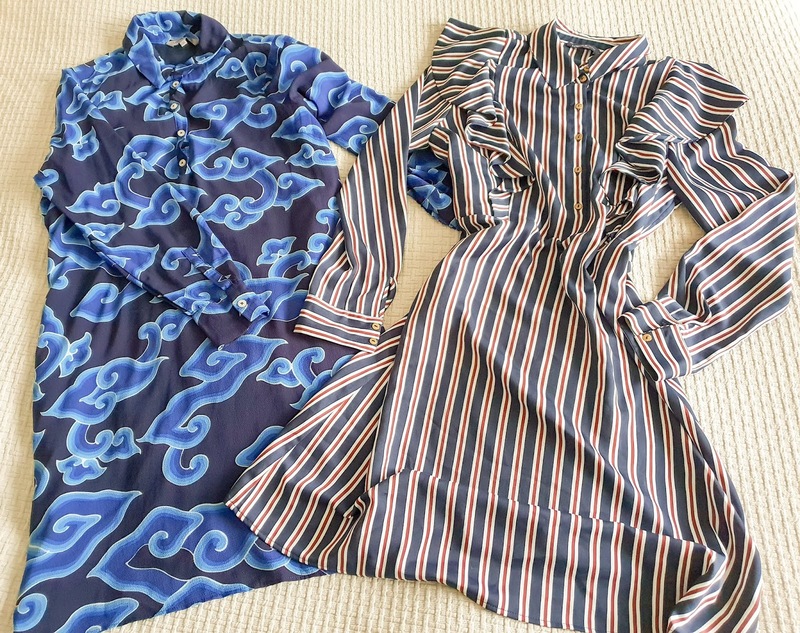 A shirt dress is another piece I love, because you can pop one on in any season and it looks tailored and chic. They're great for work when you want to look professional and polished but you don't want to think about matching pieces together in the morning, plus I can feed the baby in them now. I picked up these two styles - one with this bold print that has a Murakami vibe going on and the other navy with a thin cream and burgundy stripe and these fantastic structural ruffles to give the design an extra bit of oomph. I also found a gorgeous taupe wrap that is pure cashmere for such a good price. 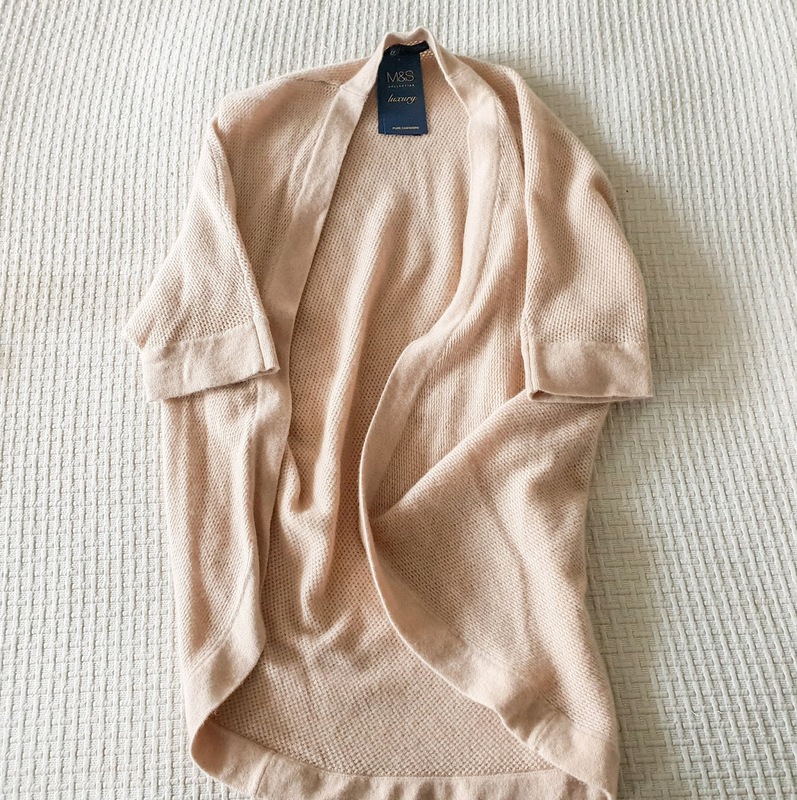 It's really slouchy and snuggly soft - I thought it would be an ideal layering piece over a plain black polo neck and also something beautiful to travel in as well. What could be easier to throw on than a t-shirt? And yet this one brings all the party with its textured gold brocade fabric and the black silk inset shoulder panels. This would be my go-to choice for a Christmas day outfit as it strikes a great balance between dressy and casual, and it would also work really well for festive drinks. Coats from Ted Baker are always super smart, and this pretty grey number is beautifully made. I really like funnel neck styles as they're very elongating and quite dramatic while also being cosy. A lot of winter coats are black, so it's nice to have something a little lighter that will transition into a chilly spring nicely. This silhouette will look great with slim jeans and knee high boots. When it comes to footwear, comfort and practicality rules in my world. Having a small baby and a toddler pretty much rules out heels for most occasions, and I need something I can run around the park in. Chelsea boots are fab because they pair will with skirts or trousers and have that slip on and go factor. 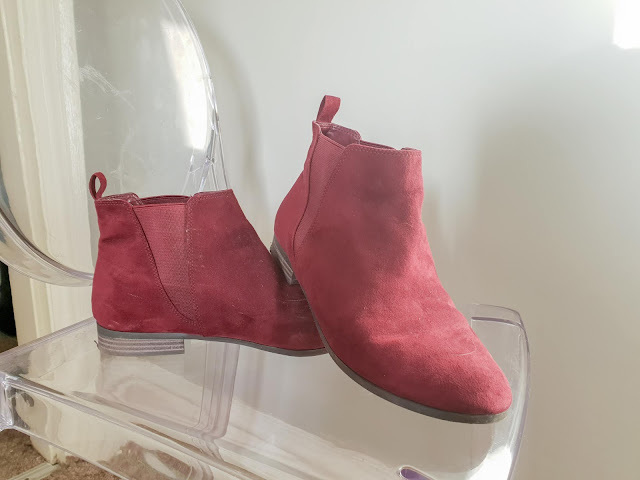 The burgundy colour of these appealed to me as I tend to wear a lot of black, navy, grey, camel and other neutral tones and sometimes need a bit of a lift for an outfit, but burgundy is also easy to wear. 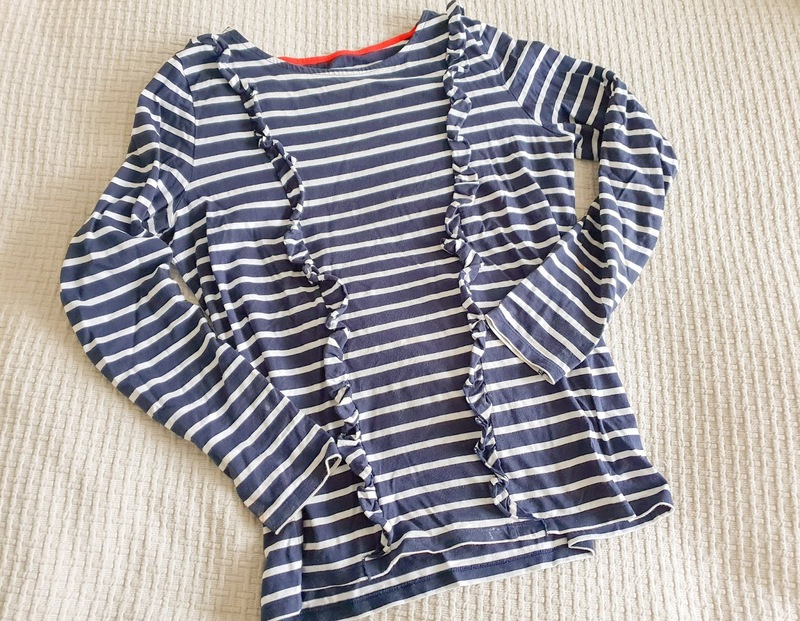 Sainsburys are a bit of a hidden gem when it comes to clothing and their Tu range has the odd amazing piece - well worth checking out when you're picking up the weekly shop. 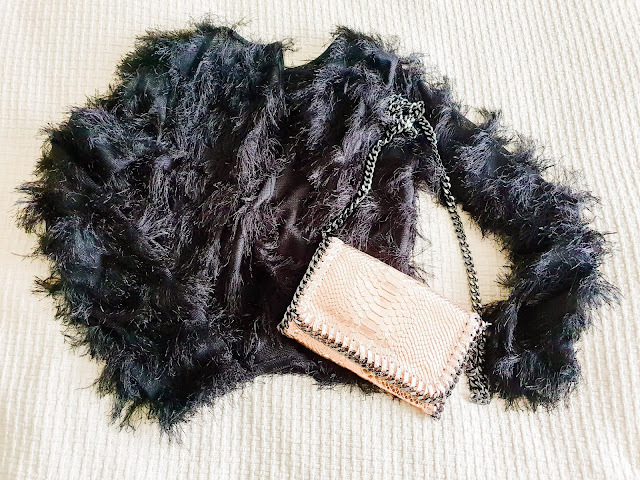 After a great bag for party season? This little beaut ticks a whole lot of boxes. Okay, so it's clearly ‘inspired’ by a Stella McCartney design, right down to the cheeky name, but at least you won't be crying if you spill tequila down it! I loved the patterned snake finish and heavy chain link detailing. I'm not one for clutch bags a lot of the time as I find them fussy and awkward. I like that this is hands-free and pulls off the trick of being both compact and spacious. Basic black was my default choice until a spotted this rather fabulous rose gold metallic option, but this bag does come in pretty much every colour under the sun. It pairs well with this glamorous black tasselled cardigan. 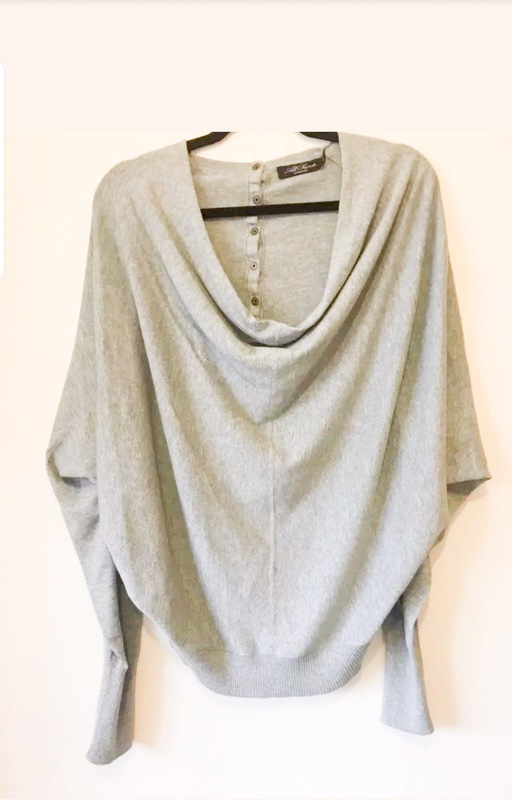 This will be perfect for times when you need a cover up that looks a bit dressier, or it also adds impact to basics effortlessly. So along with grey roll necks, leather skirts and black jeans, Breton tees are an item I constantly purchase. They're a go-to basic for me as they add a little pattern without being too challenging! Of course I own far too many but I couldn't resist this one because the ruffles give it a point of difference, and I'm all about those elevated basics to make it look like you’re more pulled together than you are. 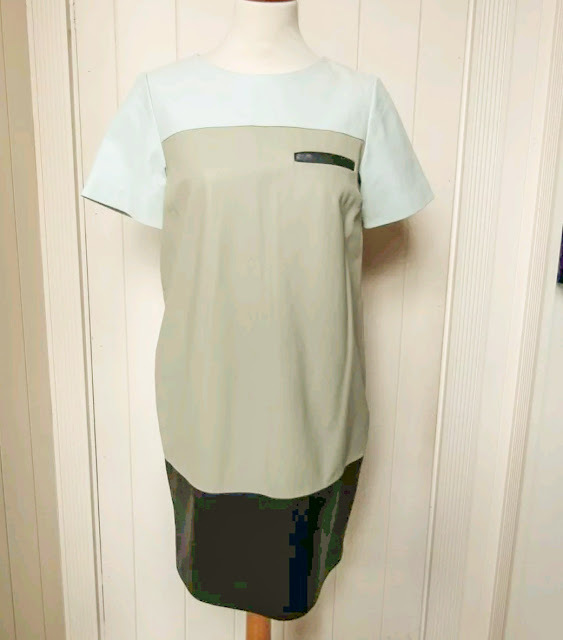 When a piece already goes with half the contents of your wardrobe it should always be a green light. My favourite combination of the moment for it is paired with the black leather mini, opaques and the burgundy Chelsea boots. The appeal of slogans has been going strong for a couple of of years now, with last years slogan tees mutating into statement knits. 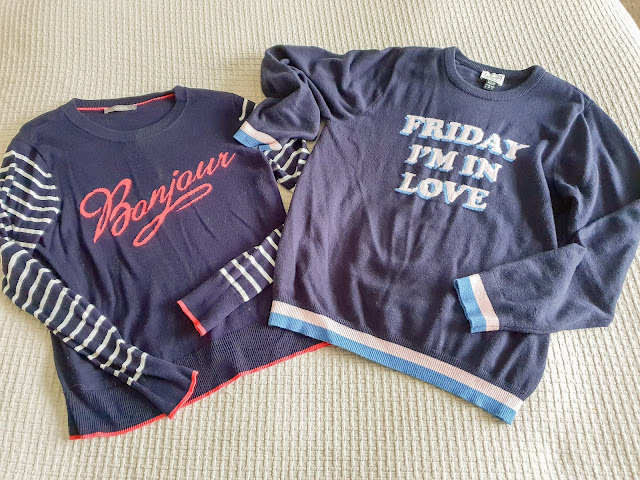 I really like the Bella Freud jumpers which combine traditional designs with a cheeky phrase or two, but they're super expensive, so I've tried to hunt out some alternatives. 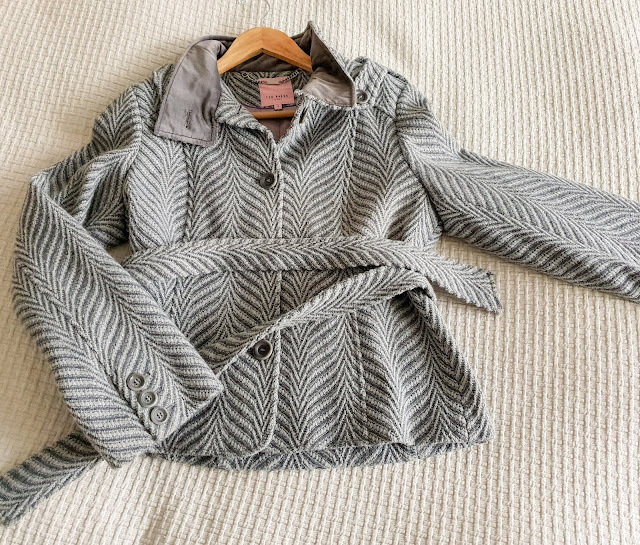 Having a cropped jacket is a great addition to your wardrobe, because they sit so well over longer line pieces and things where a normal jacket can look awkward. They're also quite a good figure fixer for a mum tum, as the line finishes just above your narrowest part and tricks the eye. High waisted bottom halves pair well with them to visually draw your figure up and they look good over big jumpers, which I live in right now! I also love the quilted detailing on this jacket. 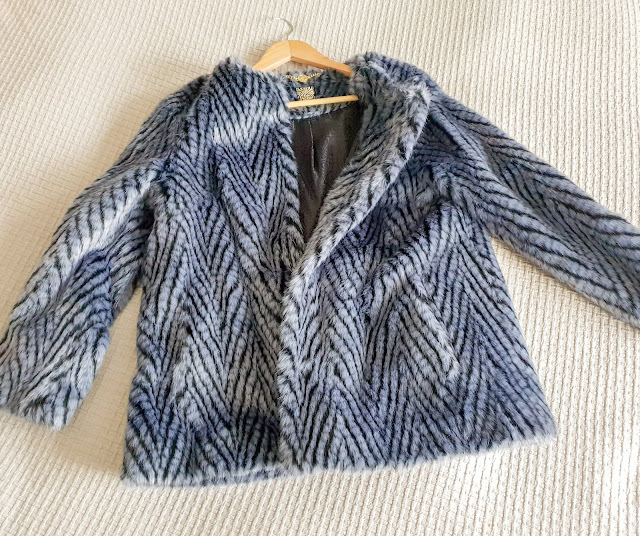 So far, it's been a pretty mild late autumn, but with headlines warning of plummeting temperatures ahead and remembering how cold and snowy it was back in March and April, it occured to me that I probably needed something warmer than the coats I have at the moment. 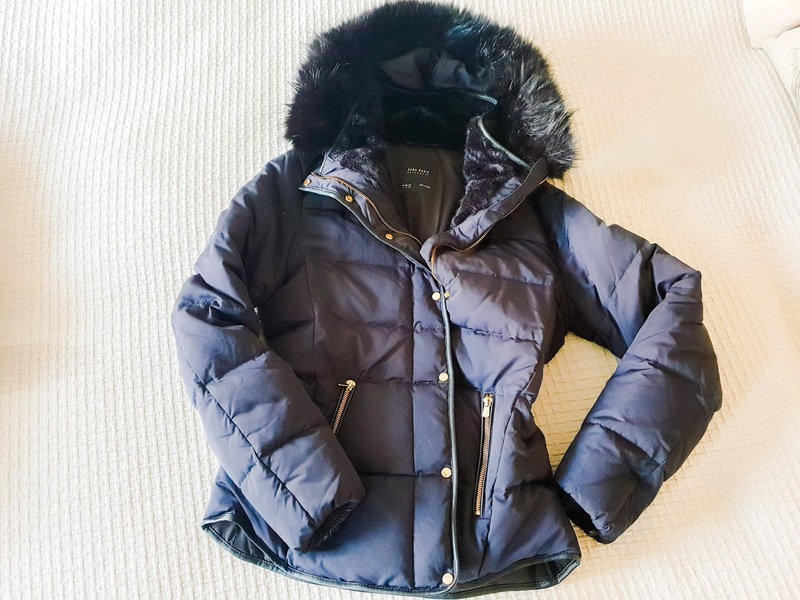 In sleek dark navy with a black fur lined hood, I liked the slim fit and the details like the slim black leather trim. I'm hoping this will keep me toasty on the cold morning nursery runs! This shirt dress with ruffled skirt is the ideal winter piece for day or night for me. It's stylish but the button front means that I can breastfeed in it easily too. Worn with a longline cardigan or a leather jacket and ankle boots, it's the kind of piece that can take you anywhere, from mummy coffee mornings to a date night dinner. And of course being leopard, I couldn't resist it! Everyone knows All Saints for their leather jackets and party dresses, but I’m falling for their knitwear too. They do some really nice pieces which are easy to wear and look great. 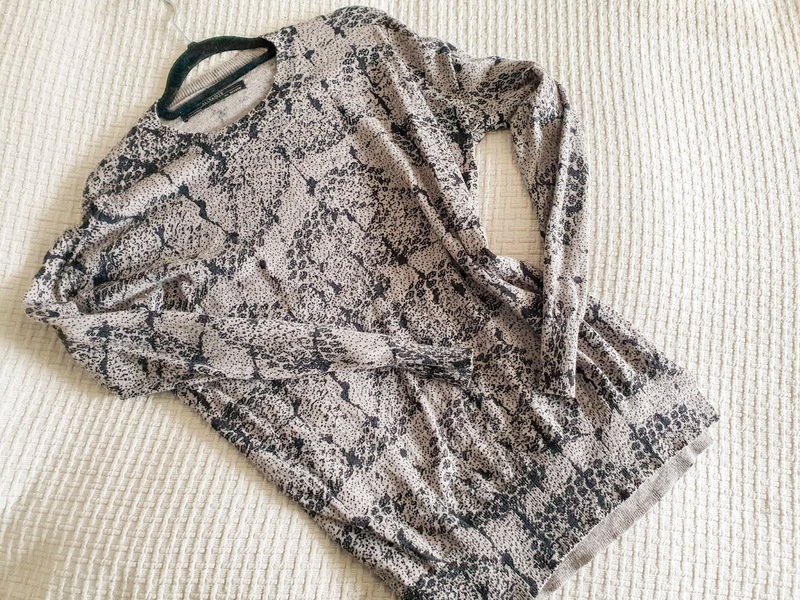 The jumper with an enlarged python print is just such a nice fit, and looks great with leather trousers or black skinny jeans. While the drapey grey knit is so fluid. It has metal poppers all up the back which you could also wear at the front or even wear it as a cardigan, so it's really versatile too. 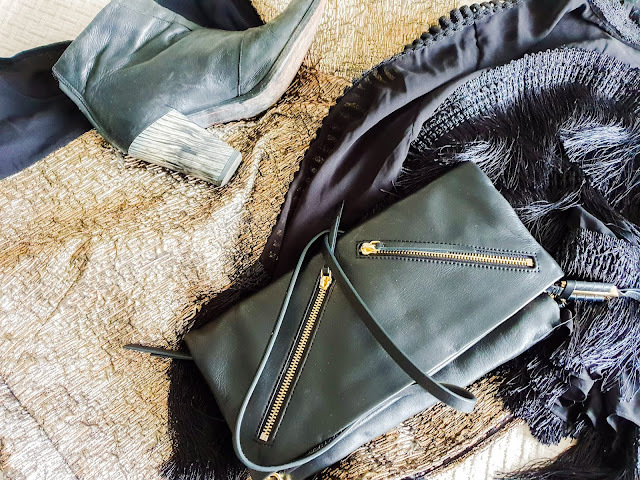 A practical black tote is a wardrobe staple, but it's not something I actually owned before now! Perfect for everything from taking to the office to using as an airport carry-on, this beautiful perforated design with pyramidal gold hardware makes this so appealing. I love the jewellery from this brand and have been slowly collecting the bags as well as they're so well made and cleverly designed. This is an open bag so I'd be likely to pop a smaller handbag inside, although there is a jump clip on with a zipped linen pouch attached to keep your essentials safe. Such a gorgeous design and super practical too. A great pair of black ankle boots is an absolute essential and this pair are just beautiful, with their elegant almond toe shape and the black and white marbled heel adding a point of difference. 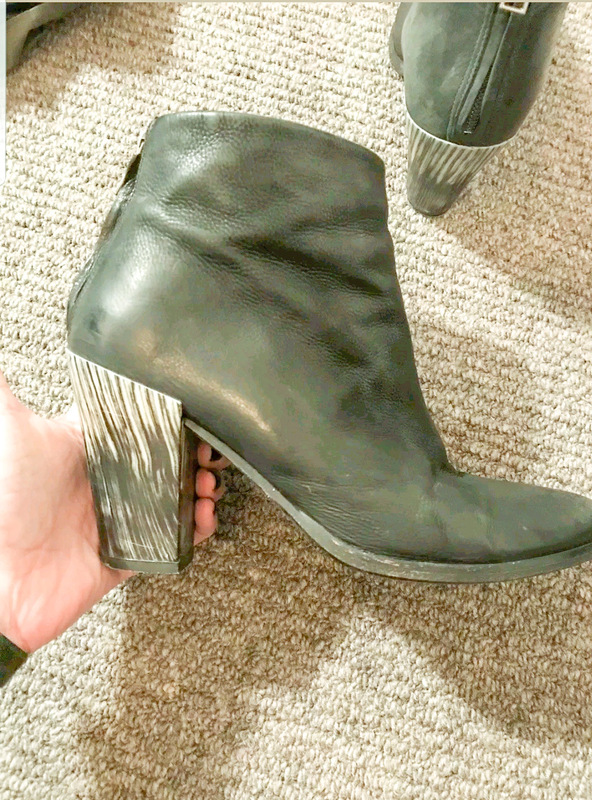 They are fairly high but the block heel makes them sturdy as well, so they are easy to wear and will go with most everything in my wardrobe. I especially love the combination of ankle boots with a dress, so that will be my party season look sorted! 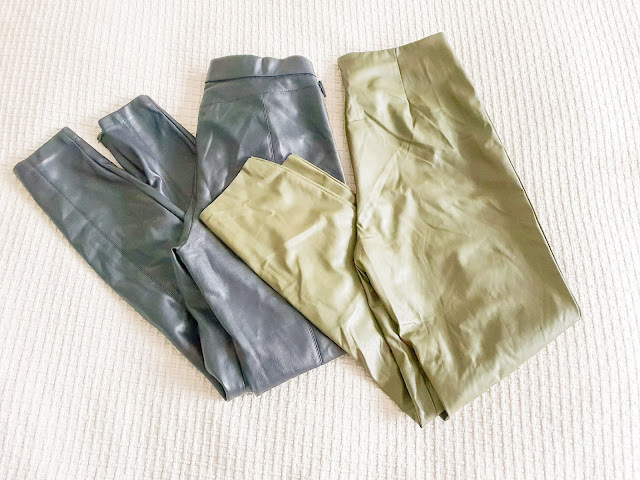 I've spoken quite a bit about my love for leather trousers and leather clothes in general (despite being mentally scarred by the episode of Friends where Ross gets stuck in his pair! ), so I updated my winter wardrobe with a couple of pairs. 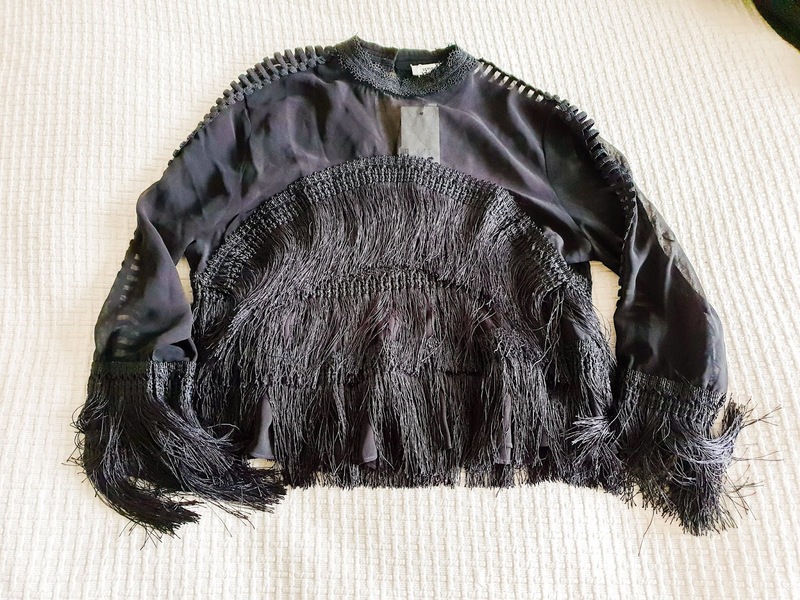 Zara are a brilliant high street go to for pieces that look far more expensive than they are, and their leather pieces are always finished really nicely. I'll wear these for my winter evenings out with my Biba fur coat and feel very Kate Moss. The khaki pair are a nice twist in a different colour and I'm seeing them with an oversized sweatshirt. I actually made a special trip into town just to get my hands on this, after seeing it pop up on a few of my favourite bloggers. As a huge fan of anything leopard, it was calling my name. The fabric is this fuzzy, sort of mohair and its ridiculously warm. I sized up to get an oversized, slouchy fit and it has to be one of the comfiest jumpers in my collection. I've had so many complements on this so I'm really glad I made the effort to go and get it! And finally, a very special treat. My collection of Stella & Dot bags is growing all the time. 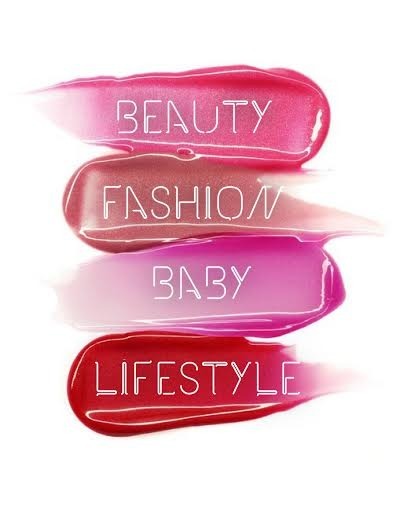 I love them because they are beautifully made, well designed and highly versatile. 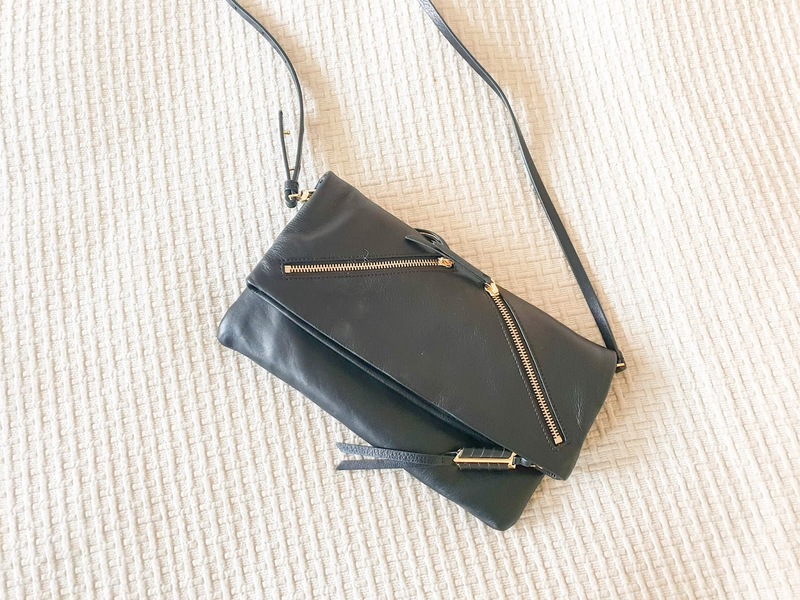 I especially love the Waverly style - a sleek foldover design that can be used as a clutch, a small crossbody or folded out into a larger one. I've got a couple in different colours and finishes. It's the ideal fusion of beauty and practicality. 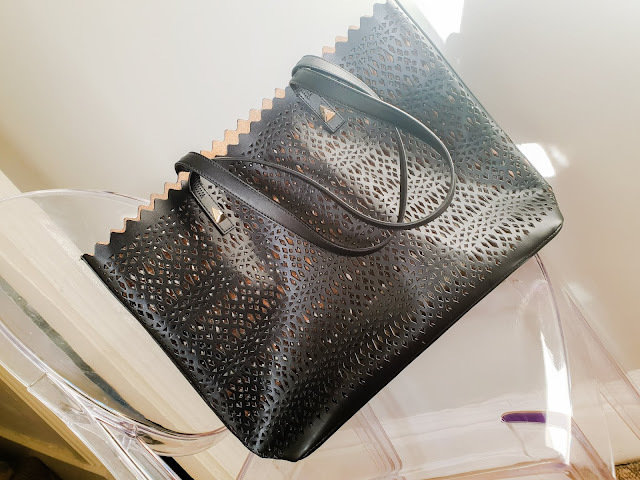 A while back, they launched the Covet line, which is their deluxe offering, and as soon as I saw they were doing a version of the bag I set my heart on it! This is made of real, buttersoft leather and beautifully finished with gold hardware. It's just a stunning bag and the best part is I already know how much use I'm going to get from it. And that is my winter fashion haul. What styles have you been loving lately?